If there’s one thing I enjoy more than watching a professional chef at work, it’s eating the food I’ve seen created in front of me. My best experience of this on Mallorca was now quite a while ago, at Tomeu Caldentey’s Michelin-starred restaurant Es Molí d’en Bou in Sa Coma; I was there to write a restaurant review, and the photographer and I sat at the chef’s table in the kitchen to watch the brigade at work and dine on the results. An amazing experience. 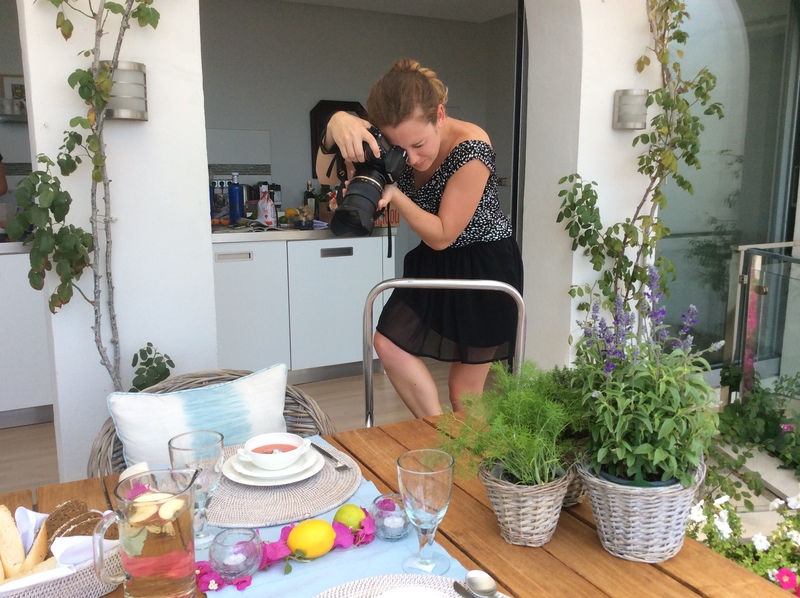 Another enjoyable experience was attending a photo shoot for a recipe feature to appear in the 2015 abcMallorca Property Special. Chef Katy Rosales, who owns The Galley Club Cookery School in Santa Catalina, Palma, was preparing delicious dishes for summer entertaining. I should add that the following photos are my own, taken on an iPad, and not the work of this professional photographer – whose images can be seen in the article. Photographer Sara Savage focuses on the food. Katy spent the morning preparing and cooking her chosen dishes. I had been given her recipes, in Spanish, from which I created the English-language versions. I was there to clarify a few points, and to join in the best part of the shoot – the testing of the dishes! 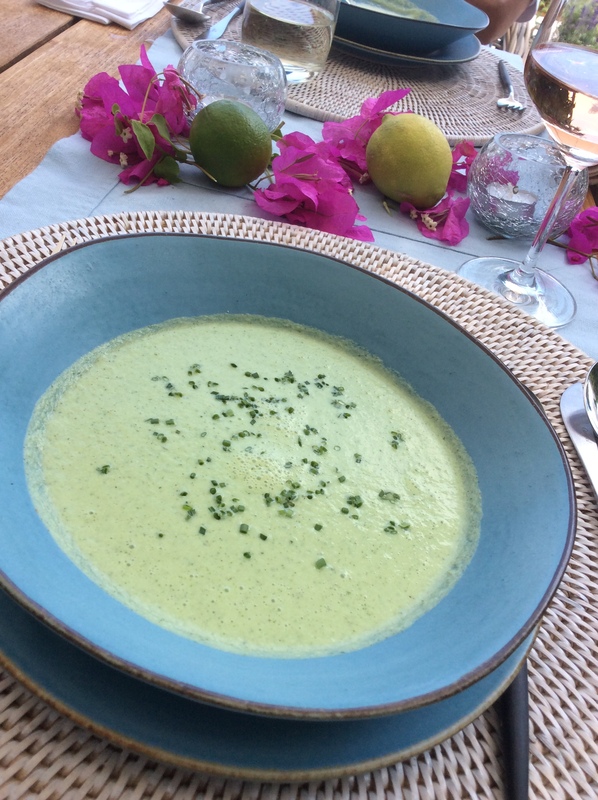 It was a delicious menu and I have since made the chilled cucumber, yoghurt and mint soup, and the creamy coconut pudding with rum-soaked early figs a few times when we’ve been entertaining at home. They’re both easy to prepare and taste amazing. Chilled cucumber, yogurt, and mint soup, by Katy Rosales. 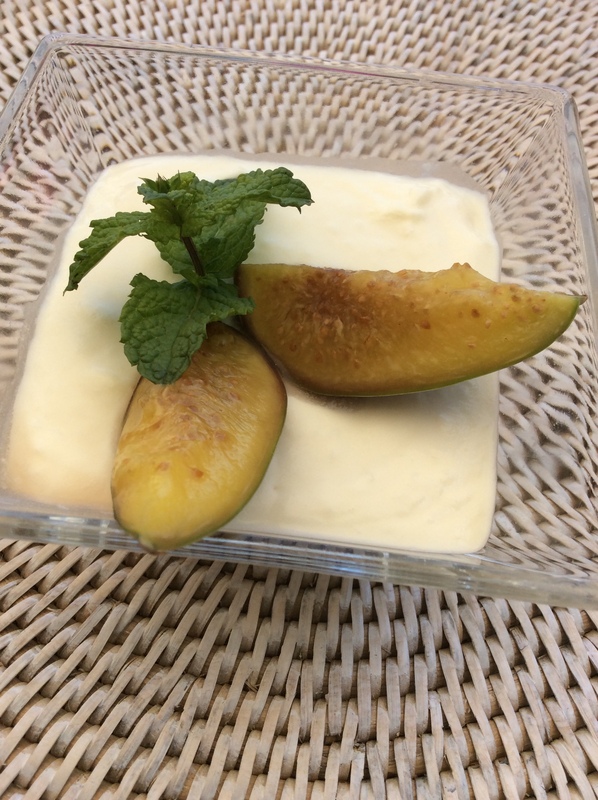 A taste of the Caribbean on Mallorca: Katy’s creamy coconut pudding with rum-soaked early figs. How do you bake fish in salt? One dish Katy made was fish baked in salt – something I’ve made many times in my own kitchen, using a Rick Stein recipe. Interestingly, Katy’s version didn’t involve mixing egg whites with the salt before packing it around the fish. When I questioned this, she told me that, as far as she knew, it was only in Britain that people do this. Who knew? Next time I make this dish, I’ll use just salt, as Katy does, sprinkling the salt coating with just a little water from a wetted hand . . .